Items found on GO trains and buses and at stations and terminals are sent to our Lost and Found office. Click here to fill out and submit a lost item form. To claim your item, you’ll need to provide ID and proof of ownership, such as the number of a lost cell phone or the password for a laptop computer. If you can’t get to us in-person, someone can claim the item on your behalf if you give us their name, or you can call a courier service to set up a pre-paid pick-up from our office. It usually takes around five business days for a lost item to be brought to our office, and we’ll hold it for 30 business days. We donate unclaimed items. 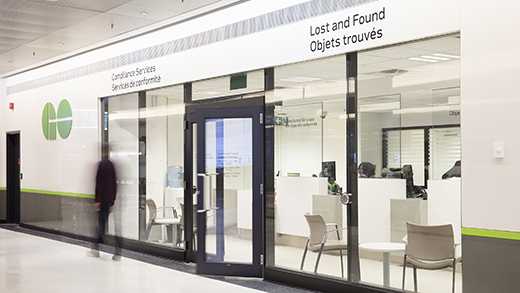 The Lost and Found office is located in the York Concourse in Union Station, 35 York Street. Monday to Friday: 7:05 a.m. to 7:30 p.m.
Saturday and Sunday: 10 a.m. to 5:30 p.m.
We’re closed on all statutory holidays.